A couple years ago, the Washington Capitals brought Justin Williams in on a two-year deal in order to help win their first Stanley Cup in franchise history. That didn’t happen, and now Williams is set to hit the open market once again this summer and will be a hot commodity for a team looking for that grizzled veteran to help get them over the hump. Is Justin Williams still Mr. Game 7? Yes, yes he is. Even the futility of the Washington Capitals can’t take away Williams’ legendary status. The veteran winger was 7-0 in career playoff Game 7s, but suffered his first defeat at the hands of the Pittsburgh Penguins. Though, I wouldn’t blame that on Williams, because the curse in Washington is clearly so strong that even Williams’ magic, his seven goals and seven assists through seven career Game 7s, couldn’t push the Capitals over the top. Despite losing that elimination game to Pittsburgh, Williams is still an incredibly clutch player who always seems to come up big in important situations. I know, I know, being clutch isn’t actually a thing blah blah blah, but the fact of the matter is Williams always seems to be the one coming through and scoring a key goal. Even if you don’t believe in that stuff about players being clutch, Williams is consistently good in other situations too. Like in 2014 when the Kings won their second Stanley Cup, Williams was awarded the Conn Smythe Trophy for scoring nine goals and 16 assists over their 26-game run. When they won for the first time in 2012, he put up 15 points in 20 games, and in 2006 with the Carolina Hurricanes, Williams scored 18 points in 25 games. Then there’s his regular season play which has turned him into a darling of the analytics community. Williams, in the 10 seasons that fancy stats have been tracked, has only once posted a negative Corsi For percentage, and that came in 12 games after being traded from Carolina to Los Angeles. Otherwise, Williams has consistently put up very impressive shot attempt differential figures both in terms of raw numbers and in relation to his teammates. So what we have here is a player that everybody can agree on. You like statistics and want to see the things a player can do quantified? Williams has that covered with his 56.9 career CF% (5.1+ rel) and 0.61 points-per-game. You like a player who always comes up big in important situations and seems to be that guy who just wins, plain and simple? Williams has that covered with his three Stanley Cup rings and 14 points in seven career Game 7s. Jason Williams is great. Everybody wins! How much is he going to cost? Williams signed a two-year contract worth $3.25 million annually in July 2015 with the Capitals after being squeezed out of Los Angeles due to the Kings’ cap crunch. Before that, he signed a four-year deal with a $3.85 million cap hit, similar to the five-year contract worth $3.5 million annually he signed in Carolina in 2006. After the seasons he had in Washington, there’s no reason for Williams not to get another two-year deal worth north of $3 million per year. He’s turning 36 years old in October, but back-to-back 20 goal and 50 point seasons suggests Williams still has enough in the tank to be an effective player. The unfortunate thing about the Capitals coming up short again this spring? Their roster outlook. That was obviously their last chance to win with this group of players, as Williams, T.J. Oshie, and Karl Alzner and set to hit free agency and a handful of good young players are in need of RFA pay raises. The Caps have roughly $51 million tied into about half a roster. 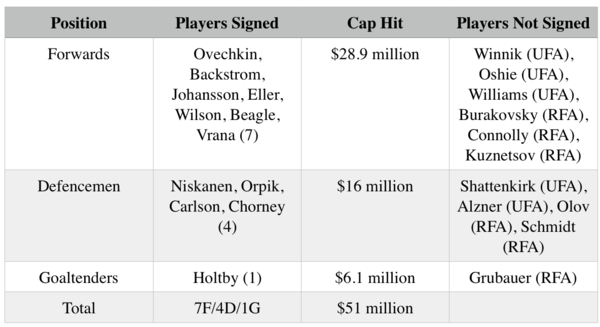 Andre Burakovsky, Evgeny Kuznetsov, Dmitry Orlov, Nate Schmidt, and Phillip Grubauer are all in need of new RFA contracts, and will eat up a good chunk of that ~$25 million in cap room. Kuznetsov will be the most expensive of the crew, being 25 years old and only a couple more seasons away from hitting UFA status. The Caps are likely to let both Oshie and Karl Alzner walk. They’re simply going to be too expensive to keep around because this summer’s free agent market is thin and favours the players. That said, Williams could possibly fit into Washington’s plans because he’s older and won’t command as much of a financial commitment. Still, though, with half of a roster signed, multiple key RFAs in need of deals, and only $25 million to work with, it wouldn’t be surprising to see Williams move on. It’s difficult to imagine Williams signing with a non-playoff team at this stage in his career. Though he would be able to get more money on a team like Arizona, where they would likely love to have him around as a veteran presence, it would be weird for a player at his age to ride of into the sunset like that. Instead, Williams’ agent will be getting calls from many contending teams who need a versatile winger to add to their top-nine. The Oilers didn’t get as much out of veterans Milan Lucic, Jordan Eberle, and Benoit Pouliot in the playoffs, and it likely cost them a trip to the Conference Final. Williams would be welcomed there. The Maple Leafs are loaded with talent up front, but if they go ahead and move one of them for a good, young defenceman, perhaps Williams could be a fit as the team looks to go on a major playoff run next season. The Flames swung and missed with Troy Brouwer in that ‘plays hard and comes up big in the playoffs’ role, if they end up shedding his contract in the expansion draft, Williams could be a superior replacement. But really, it’s anybody’s guess. You can cross out, like, Vancouver, Arizona, Detroit, Colorado, and teams rebuilding (or teams who are just bad even though they aren’t trying to be) and add anybody who’s close to winning a Cup to the list of teams who would be interested in Williams’ services. Should the Flames try to make a trade with the Hurricanes? That could be feasible, especially if we move some money off the books ie Ebs, Poul, Fayne etc. Would be great if we could get him for a value 1 year contract, as a team on the rise, even though I doubt it! The free agent pool this year is thin, and the oilers shouldn’t overreach in term or money in free agency on players. Try and get top 4 D-man from an organization who will probably lose a D man to Las Vegas in the expansion draft and therefore might wanna get some value rather than losing a player outright. ie NY Islanders, Minnesota, Jets, Ducks, Carolina etc. Wait until after the expansion draft for a bargain contract if there is one; ie this year’s version of a Kris Russell (right cap hit and length of contract). Possibly add spencer foo for organizational depth, baiting him with an opportunity to start depending on his training camp, but make no guarantee’s. Just some thoughts. 36 – 38 year player is not a good range. Risk is too high for a $3M commitment. Pass. He has only missed 3 games over the last 5 seasons and averaged 20 goals over that time. At 36, I would offer him a 1 year $2.75 mill contract. Oilers need a 1 year stop gap for Pulujarvi and can play 2nd or 3rd line RW as well as 1st PP. He could easily score 20-25 goals again, he is gritty and he plays Chaireli hockey. Who knows, he could end up being a training camp invite which seems to happen to players over 35. He may play until he’s 40. If he was cheap, on a two year deal… He’d be a better option than Chiasson. Versteeg-Bennett-Williams… For 2 years… That’s a pretty good 3rd line. I’d take the chance on him! He’s a right shot that puts up points and he can be had for a little bit more than the salary we’re shedding by letting Hendricks retire. If we want Eberle to turn it around, we need direct replacements to provide competition; Williams looks like he’s in that range. The only thing i’d need to see is his foot speed. If he’s a slug, then i dont think we could make it work. But if he gets around alright (Considering Maroon and Lucic are our other top 6 wingers) then i’d definitely reach out to his agent. Correction: i thought Hendrix was 2m+, but he’s at 1.875, so Williams is a bit more than that but the point still stands. We are shedding salary in players that don’t play, so we can probably fit Williams in. I’d get Williams, a 3C and a bottom pairing RHD (on the cheap). Probably 8M total for all 3 guys. Pass,he is at the age and type of player you pick up at the trade deadline (with no more than year left on their contract)if you are looking at a Cup run. Not someone you spend valuable cap space on and hope they hold up for three more years. Chances are, playing on the best regular season team in the league over the last two years has sheltered William’s age somewhat. He could still be a good depth guy but I suspect he has some disappointing seasons coming up, especially if he doesn’t go to a legit contender. That said he has earned all of his reputation and its hard to bet against Mr. game 7. As it applies to the Oil, I don’t think its a good plan as they need to save cap space and will undoubtedly be paying extra for a reputation that is likely to depreciate quickly. To be honest I think we have cheap internal options that mostly cover what Williams would bring during the regular season. Obviously playoffs are a different story but do you want to overpay a guy just to carry him along through the season on a somewhat inflated contract, when those dollars could go towards a more important area of need (i.e. defensemen, right shooting center)? Doubt Chia wants the aging veteran or his contract that might ensue at this time . He seems to prefer a younger player to develop with youth group now on team . Bonino or Boyle sounds more logical due to price , but O’shie is not out of question , seeing as Chia expects to have cap space for just such an acquisition . If O’shie , I feel one 6M contract will be dealt – probably Eberle . Are you dictating or writing? What cost us were the referee’s. Poul and Ebs needed to come through and they didn’t. Looch was decent at least. Brouwer-like potential. Near the cliff or on the way over.